It must be one of the most intriguing looking bars I’ve found so far. This brown paper bag-like package I hold today. A cocoa farmer with a big smile stares at me. “Go on, try this bar” his eye seem to say. There is no way to turn down this request. What I’m holding here, is a bar made by Askinosie Chocolate. One of the many American bean-to-bar producers. I simply adore the US scene, as only a very few didn’t meet the expectations I had about their products. The story behind Askinosie reads like an adventure novel. Back in 2005, Shawn Askinosie, a succesful criminal defense lawyer had an epiphony on how to change his work life to a more personal rewarding job. He decided to become a chocolate maker! Starting out small and humble, his business became a well know name in the fine chocolate world. Other than producing a high quality product, Shawn was also on the forefront of direct cocoa trading and changing the life of his suppliers by sharing the profits of the company. 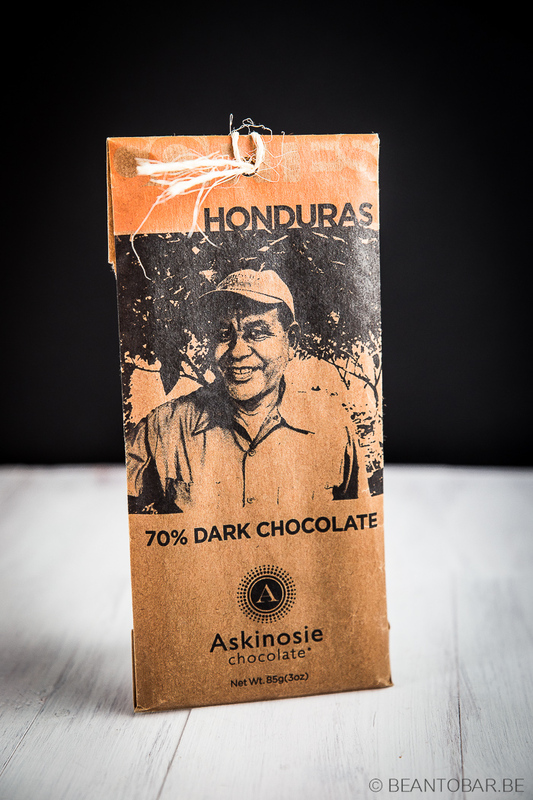 This ensures Askinosie the best quality of cocoa possible from his supplies, as they get a return on investment when they change the way they produce and ferment the cocoa beans. This way, Askinosie sets up a personal relationship with their farmers and creates a win-win situation for both sides. Once you start to learn about the small batch, bean-to-bar chocolate world, you’ll notice these companies often work this way. So by buying their products, you don’t only get a better quality chocolate, but you also help maintain a truly sustainable and ethical chocolate production. A big difference from the stories you hear in the industrial chocolate world. Honduras. An origin you don’t see to often. Honduras however has been linked to chocolate making,as it once housed the main harbor from where the Spanish conquistador Cortez set up the export of cocoa and chocolate to Europe. Unfortunately the area has suffered many setbacks in cocoa farming, including sickness and adverse weather. But a determined group of farmers preserve cocoa in the region by cultivating the best beans they can achieve. The bar stand out from other ones by the packaging alone. A very nice paper bag holds a cellophane blister containing the actual chocolate. On the bag, you find the origin, the percentage and the maker, but above all – the picture of a smiling man. Flip the bag and you will read this man is Fermin Arriaga. This farmer, together with another family produces and ferments the cocoa beans used in this bar. It represents the direct connection between Askinosie and the farmers they work with. It reminds you of the fact that chocolate isn’t just made by a chocolate maker. It is the result of a cooperation between several highly motivated people who seek to create the best product possible. 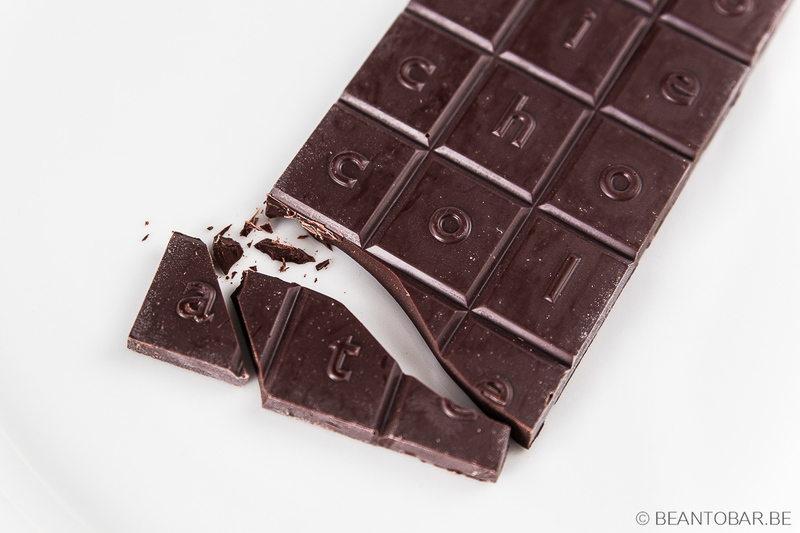 As a cherry on top of a cake, the little tie that closes the package once was a biodegradable bag used to ship the beans to the chocolate atelier in Springfield. The chocolate looks spendid. Big in size, it is scored with rectangular pieces. 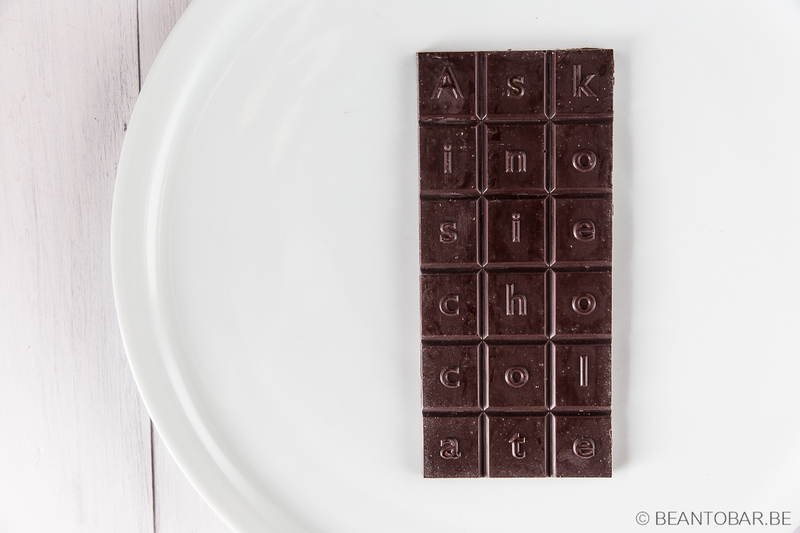 Each of them holds a letter and together they read Askinosie Chocolate. One more nice detail. I can’t get over it how much chocolate info comes together in this one bar. Taste: A good snap is audible as you break off a piece of the bar. The flavor starts of with a touch off with the licorice I noticed in the aroma. Earthy wood flavors, fresh roasted coffee and brown sugar are blend in. The main flavor remains nicely dark and chocolaty until suddenly, out of the blue, bright sour cherries pop up. Especially when you breath through your nose while tasting the chocolate, the fruits dance around in your mouth. Near the end of the melt tannins glide in as if you are tasting a fine wine and create character and depth. The aftertaste keeps the chocolate flavor alive and adds a roasted nut tone later on. It has a very nice length. This chocolate has a distinct dark heart, almost manly due to the pronounced tannins. Yet inherent sweetness and a dash of fruity acidity keep the flavor interesting. People who don’t enjoy a touch of bitterness will find this strong in nature, but I find it to be a very nice contrast to more mellow and sweet origin bars, showing there a so many different profiles to be experienced in the world of fine chocolate!